Known as the "Universal Man," Yiğit Kurt, 27, has hitchhiked through 170 cities in 35 countries on four continents. Kurt's love for travel started at a very young age, and he first went to Antalya's Olimpos at the age of 13. After completing high school, Kurt settled in Istanbul and visited the U.S. and the Netherlands as an exchange student. Once he graduated from university, he took off for Europe and Asia. During his adventures, Kurt preferred hitching rides in ambulances, police vehicles and even horse-drawn carriages while traveling. The traveler even met Bollywood star Aamir Khan, who visited Turkey few weeks ago, when he was traveling in India. Kurt shares all of his travels and adventures in his blog Evrensel Adam (Universal Man). Speaking to Anadolu Agency (AA), Kurt said he prefers to follow his traveler's instinct despite his family's objections. Saying that he was able to cover about 20,000 kilometers during his travels around the world, Kurt admitted that hitchhiking is not necessarily for everyone. "I wanted to travel as much as I could. Traveling by hitchhiking is a passion of mine as I get to meet new people and learn so much. I have so many memories that I want to share with people. I slept on the streets with the homeless, camped on a deserted island in the Maldives, traveled in million-dollar cars and in even trucks with no doors. Villagers hosted me in their homes and invited me to their weddings. When I look back, I realize I am lucky to have been able to experience all of this," Kurt said. Kurt even traveled to India just to see Bollywood star Aamir Khan and managed to set a meeting with the actor via his manager. He also visited 17 cities in India for a better understanding of the country and its culture. "My father was always worried about me getting into trouble during my travels," Kurt said. "He always wanted me to find a decent job and have a normal life. I asked my father to come along with me so he could understand me better, and he agreed. He joined me on my Malaysia trip. We bought him a backpack and walking shoes. 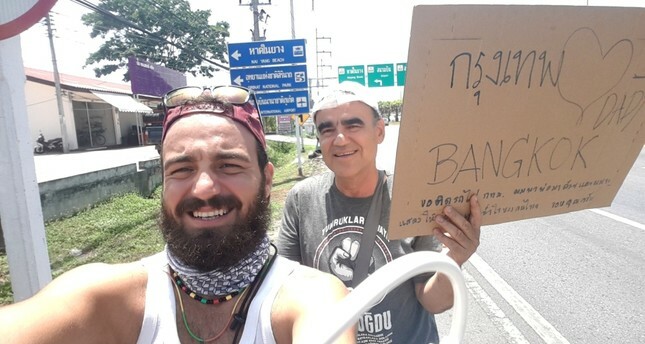 He hitchhiked for the first time in his life on Phuket Island. He disagreed with the way I traveled at first, but he got used to it. We traveled through three countries together." Also speaking to reporters, Adnan Kurt celebrated that he had finally visited a foreign country for the first time at the age of 53 and said: "I will never forget the day I hitchhiked for the first time in Malaysia. The truck driver was a woman, and we traveled with her for 400 kilometers. She bought me lunch. To pay her back, I promised to buy lunch for a backpacker in my hometown. "The proud father now advises parents to refrain from restricting their children when they want to travel. "There is nothing like meeting new people and getting to know new cultures and places," he said.